This will definitely satisfy any cheese lover because there’s gobs of cheese inside and on top to. 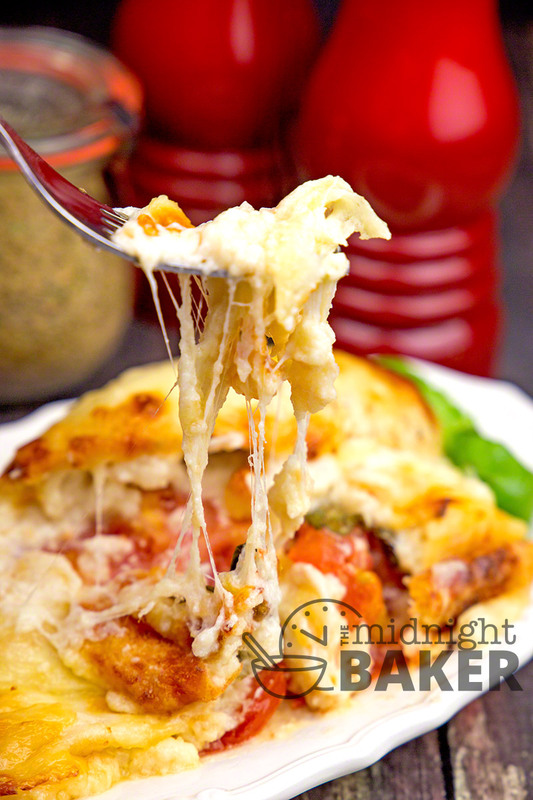 The cheese melts all over the place on the pan so make sure you line it with parchment or foil so you don’t miss one drop of the ooey gooey mozzarella! 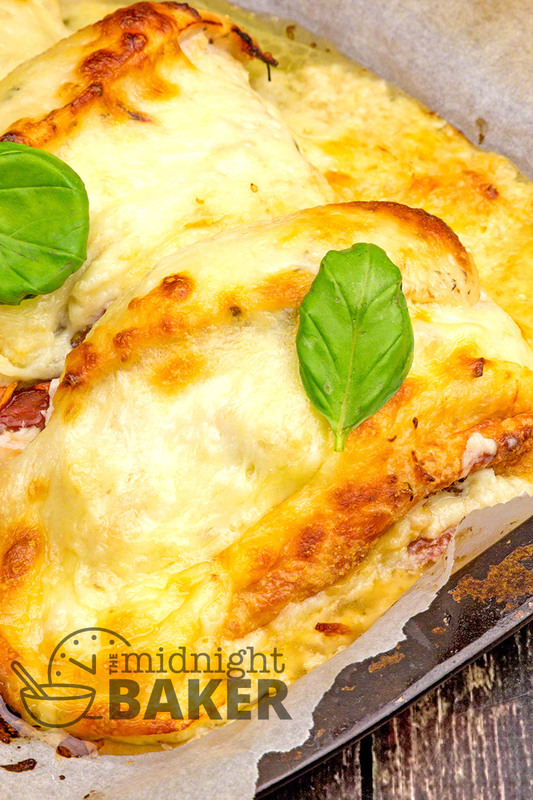 Where the cheese may be the star of this chicken recipe, it also relies on basil and tomatoes. Canned tomatoes are definitely out here because you need nice thick slices. When tomatoes are in season and if you grow your own, those are definitely best. However, it is possible to find great-tasting tomatoes in the supermarket. I find the vine ripened ones to have superb flavor. My supermarket also sells hydroponic beefsteak tomatoes and those also have a great flavor. If you’re willing to spend a bit more, try Kumatoes. They really have a home-grown tomato taste. When it comes to basil, again use fresh because the taste cannot be beat. Fresh basil is also part of the “look” of this dish too. You can usually find the whole basil plant over by the tomatoes in most produce sections. The benefit with the whole plant is you can re-pot it and it will keep on growing. The marinade is the secret to this chicken’s gourmet flavor. It’s a simple herb and garlic mixture in a sherry base. The flavor it imparts takes this chicken to a new level, so don’t skip this step even if you’re tempted. My usual way of handling cheese fillings in chicken is to shred my cheese then mix it with a bit of sour cream or soft cream cheese. 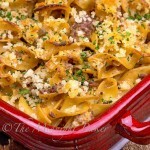 I also add a couple of tablespoons of soft breadcrumbs so the filling will stay put inside the pocket. 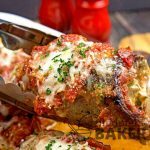 I’ve done that here, but since the additional cheese melts all over the place, this is a step that can be eliminated and you can substitute my filling mixture with a big thick slice of mozzarella. Mix marinade ingredients in a small bowl. Place butterflied chicken breast in a zipper freezer bag and pour marinade over the chicken. Seal bag and turn it a few times to coat the chicken. Let the breasts marinate about 2-3 hours. Then remove from the bag and let the excess marinade run off. 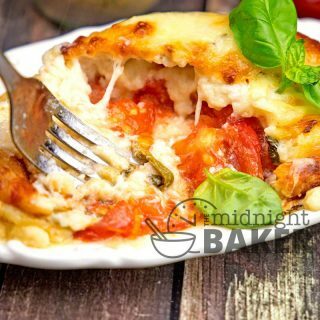 Place 1 or 2 tomato slices and about ¼ cup of fresh basil in each chicken "pocket"
Mix all the filling ingredients in a medium bowl and divide into 4 equal portions. Place each portion on top of the tomato/basil. Bake for 20 minutes. 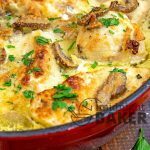 Place additional cheese on top of each chicken breast and bake for another 10-15 minutes or until top cheese is melted and starts to bubble. Depending on the size of your tomatoes, you may need 2 slices, but if you use very large tomatoes, you will probably only need one slice. 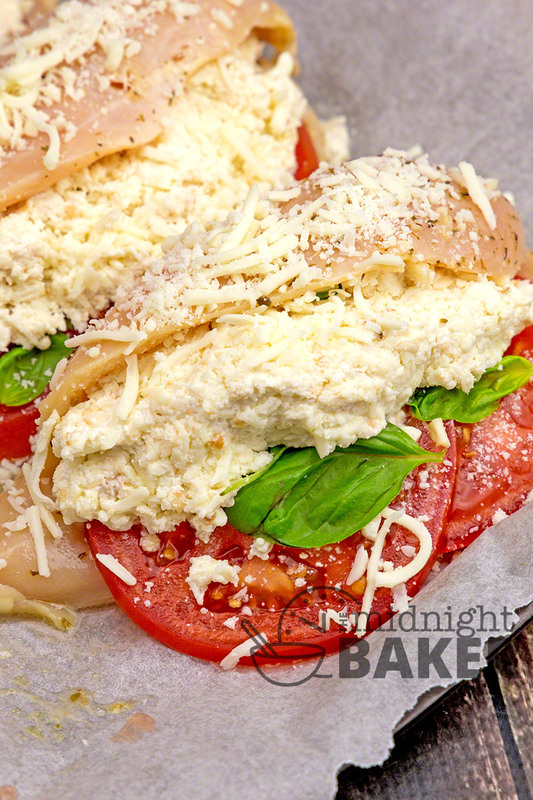 You can skip the cheese filling recipe and use 1 thick slice of mozzarella for each chicken's filling. If you do, then don't use shredded, buy the block of mozzarella and cut a nice thick slice. 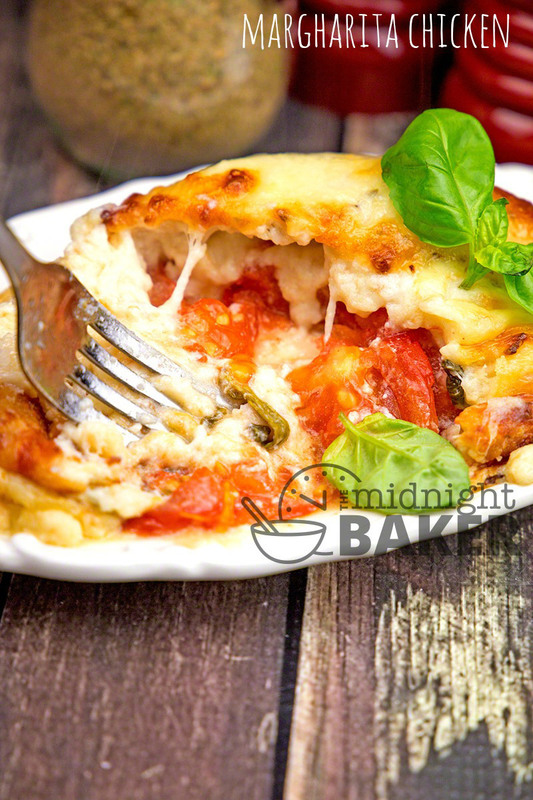 You can also eliminate the additional shredded cheese for topping by topping each breast with a thinner slice of mozzarella. 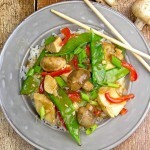 This sounds wonderful and I’m making it tomorrow night! The question I have is: I don’t have Sherry (or any alcohol) is there something else I can use? I don’t want to buy a bottle use a little then have it go bad. I love your recipes and have tried quite a few of them!! Hi Kathy–you’d need something acidic to replace the sherry in the marinade. I think what I would do is use either watered-down lemon juice or balsamic vinegar. You’ll have to cut the acidity of either of those because they are almost pure acid where wine/sherry isn’t. Another thing you could try is giving the chicken breasts a dry rub of salt, pepper & oregano. I think I’d go with the rub first because it would give it closest flavor to the original.